Examining the roots of the United Auto Workers’ defeat at Volkswagen’s Chattanooga, Tenn., plant. On Friday afternoon, a reporter friend of mine emailed me to ask what I thought would happen that night when the votes were counted at the Volkswagen plant in Chattanooga, Tenn. Would the UAW finally break through and organize a “transplant,” an auto plant owned by a foreign company? I nailed it exactly, the result of a combination of twenty-three years working in the labor movement and years more studying it, my own skeptical temperament — which, when others shout “¡Si se puede!” makes me think, “Hey, this is tougher than you think” — and, mostly, dumb luck. But the signs were not good, and as we learn more from reporting after the vote, this was always a longer shot than the UAW and pro-union workers let on. In a way, it’s impressive the UAW got 47 percent — that’s a lot better than the 2-1 beating the union took at the Nissan plant in Smyrna, Tenn., a couple hours northwest of Chattanooga, in 2001. But the UAW probably overlearned some lessons from that defeat. There’s an old saying in labor: “The boss makes the best organizer.” In this campaign, the UAW — for entirely understandable reasons — sidelined its best organizer. The union didn’t give the workers enough reason to upset the massive status quo bias in an overwhelmingly white evangelical region of an anti-union Southern state against unionization. In this age of labor’s long decline, every American union understands that if the company can be somehow persuaded — pressured, more accurately — to forego its “free speech” rights (enhanced under Taft Hartley in 1947) to engage in open union-busting and agrees to be neutral, the union has a much better chance to win. A company ruthlessly determined to bust a union drive has a lot of advantages on its side — not least of them that it’s the entity that signs the worker’s checks and can find ways, often illegal, to stop signing them — either individually by firing union advocates, or, in manufacturing, collectively by moving the worksite to a lower wage haven. So the UAW, gravely weakened since its thirty-year peak between the 1940s and 1970s, desperately wanted to take Volkswagen off the chessboard. And of course, VW, like other German companies, practices “co-determination.” Fifty percent of its board of supervisors is composed of employee representatives, a combination of rank and file leadership and officials of perhaps the most powerful union in the world, Germany’s IG Metall. The UAW has been working with IG Metall, urging it to use its influence over the German car companies for many years. But why VW? There was some promising precedent: UAW had already organized VW at the very first transplant in Pennsylvania in the seventies — the plant closed in 1988, and the union was never able to replicate that success with any other foreign-based carmakers. Mercedes and BMW also have plants in the US, and their boards also have 50 percent employee representation. Yet only VW has an unusual relationship emerging from the World War II that gives its home base, the German state of Lower Saxony, 20 percent voting rights in the company. This gives the government of Lower Saxony the right to appoint two members of the ten shareholder representatives to the Board. So in early 2013, when a Social Democratic–Green coalition was elected into power in Saxony, the president and labor relations chief of the state government were installed onto VW board — effectively giving the employee/union/broad left 60 percent control. So perhaps VW could be moved easier than the others, and they were. This made the campaign a supply side effort, however — the workers themselves, in large numbers, were not demanding a union at VW. It turns out that VW is a pretty good employer. Its wages aren’t quite as good as some of the other foreign transplants, but they are better than what a non-college educated workforce can get pretty much anywhere else in the Chattanooga area. The workers get good deals on car leases and ownership. There are safety and health issues, but not at the terrible level of the Smyrna plant. So VW wasn’t fighting the union drive — but it seems that most workers weren’t fighting VW very hard, either. Marx would have mordantly chuckled to see how the “committee for managing the common affairs of the whole bourgeoisie,” the reactionary, anti-union political elites of Tennessee, were joined by national extremist libertarians like Grover Norquist to threaten and intimidate the workers. In this case, the politicians — usually content to serve as agit-prop amplification for corporations aggressively advancing their own class interests — more than compensated for VW’s docility. The “laboratory conditions” that the NLRA promises for union secret ballot elections were obviously contaminated, although the Board has very little case law for a third party doing this, rather than a company itself. That the UAW claimed that a majority of workers signed union authorization cards is, as it surely knew, no guarantee that it would keep that majority in the face of this kind of coercion. Nor did the likely composition of the workforce promise to lean pro-union. One recent survey compilation put Tennessee as first in the nation at 47 percent for its population of white evangelicals, a demographic that votes 4-1 Republican. I haven’t been able to find any demographic information about the workforce, but it seemed in media accounts to be overwhelmingly white and male. Hamilton County, where the plant is located, voted for Mitt Romney with about 57 percent of the vote, not much below the entire state’s vote of 59 percent. It’s pretty hard to imagine a less compatible workforce in 2014 than one with a majority of white males who are evangelical Protestants in a rabidly anti-union Southern state. One worker was quoted in the Dallas Morning News as saying, “I’m a Christian and a conservative and I refuse to give my [union dues] to things I oppose, like Planned Parenthood, gun control and the Democratic Party.” It’s certain there were many more like him at the VW plant. Of course, this was all known going into the fight — the point, of course, was for the UAW to overcome these obvious obstacles and organize the South, the goal of union activists since the ill-fated effort by the CIO, Operation Dixie, in the late 1940s. So how did the union fight back? If some workers were surely worried that VW would not receive state subsidies or otherwise see its business curtailed by the general anti-union economic ecology surrounding the plant, and if others were likely supporters of anti-union GOP politicians like Sen. Bob Corker, how did the union sell unionism to a workforce that had not organically chosen this fight? 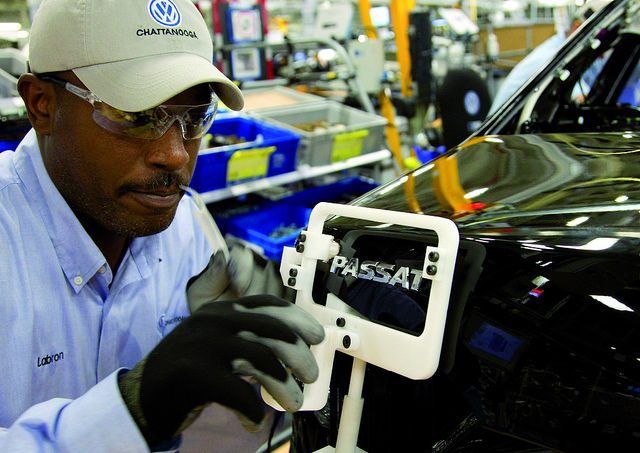 The UAW presented itself to the workforce as in partnership with VW. Together, union and company promised German style works councils to cooperatively address workplace conditions that don’t involve wages and benefits. Unlike Germany, in the US, you can’t have a works council without a union because the NLRA, composed by pro-union New Deal liberals assumed that a non-union organization explicitly supported by the company would be a kind of company union that wouldn’t be the worker’s own chosen organization to represent their interests. Mike Elk of In These Times reported from the scene that the UAW faced the dilemma of convincing workers that, despite its recent history of negotiating givebacks and two tier agreements with the Big Three domestic auto producers, it would not do so in Chattanooga. This became more difficult to do when workers read the UAW/VW Neutrality Agreement and saw that the union had pledged that it would do its part to maintain and even enhance the company’s “cost advantages . . . . relative to its competitors.” One worker quoted by Elk said, “What the UAW is offering, we can already do without them.” In trying to appear unthreatening to a skeptical workforce, the UAW allowed itself to look like, well, sort of a company union. Some people have noted that VW didn’t permit the UAW to house call as part of their agreement. But the union did have almost unprecedented access to the plant for the last ten days of the campaign, and held joint meetings with the company to answer workers’ questions. Unions have lost plenty of campaigns where they’ve made countless house calls. They aren’t an organizing panacea. In Germany, they aren’t done, nor are they perceived as necessary, which is why VW wouldn’t permit them. And if the UAW had balked at this provision, they would have risked blowing up the agreement with VW — the central plank of their organizing strategy — which they had worked with IG Metall to elicit for several years. Anybody can take the litany of factors I mention above and pick out the ones they think were most salient. Yes, the opposition of political elites was potent. Yes, the UAW neutralized VW, but, by turning it into a corporate pussycat, could barely provide a rationale for workers joining the union at all. Nor did it convey to the workers that it had the leverage to fight the company when necessary on their behalf, rather than accede to it as it had done with GM, Ford, and Chrysler. Yes, it’s the mostly white South, and it was a likely largely evangelical workforce, to boot. This is all overdetermined, and other organizing possibilities have their own challenges. Nicole Aschoff, in a post here at Jacobin , argues that the UAW should turn its attention to the 70 percent of vehicle sector employees working toiling at mostly small parts supply companies. But the logistic of such a campaign make that undertaking very daunting. Organizing is very labor intensive, and the intense labor comes from organizers. Every union will admit that it never has enough good organizers, a high stress, long hours, high skill, low pay, often depressing job. Almost twenty years ago, the Steelworkers gave up on a similar kind of campaign at small steel finishing units. As I’ve written elsewhere, basic manufacturing was, in some ways, easier to organize at huge worksites of tens of thousands of workers than it or the retail sector is today at countless, disparately located facilities of several hundred workers or less. The sheer organizing person power doesn’t exist — the goal should be to somehow increase the size of organizing departments by several fold before any such campaign can be undertaken. There is certainly no working class inherently predisposed to achieve emancipation — I hope we all understand that by now. The Marx of human agency has to be privileged over the Marx of the “iron bound laws of history.” And there is no natural worker’s majority for unionization, either. There never has been. It has always required organizing and struggle. That’s the “optimism of the will” part we must sustain. But it becomes more difficult not to drift further towards the “pessimism of the intellect” clause of that famous phrase after a loss as crushing as the one in Chattanooga. As I said to my reporter friend when I guessed the outcome in Chattanooga, I hope I’m wrong. Rich Yeselson worked for twenty-three years in the labor movement as a strategic campaigner. He is now a writer in Washington, DC.